Three churches recently closed down by authorities in Algeria’s northern province of Oran have been told they can reopen. The three churches, located in Oran city, Ain Turk (30km west of Oran), and El Ayaida (35km east of Oran), were closed between November 2017 and February 2018. On Sunday, two of the three churches were allowed to reopen following a notification issued by the governor of Oran province. The one in El Ayaida also received a notification that it would be reopened, but for the time being it remains closed. Rachid Seghir, who is the pastor at the main church of Oran city, told World Watch Monitor about the moment he received the notification. “It was about 1pm when I got a call asking me to get to the police station as soon as possible, without giving further details,” he recalled. At the police station, Pastor Seghir was handed a notification to sign. The pastor then left the police station and went directly to the church to share the news with some church members, as he continued to reflect on the event. Just 45 minutes after he was first called to the police station, three officers in uniform came and removed the seals from the church’s main door, without making any comment. In their notification, the local authorities also did not provide any reasons justifying their change of stance. The document only stipulated “the place of worship belonging to the Protestant church located at Abane Ramdane street will be reopened”, and that state services, including the police, “will work towards the implementation of this decision”. Later, Pastor Seghir received two other notifications regarding the churches in Ain Turk and El Ayaida. “We are very pleased to be able to resume our activities without fear of new threats. We hope that all churches can be regularised and able to work in peace and freedom. Such a thing can only be beneficial to the image of the country,” he added. L’Eglise Protestante d’Algerie, the umbrella organisation linking 45 Protestant churches in Algeria (EPA), has welcomed the decision to reopen the churches. In a statement issued yesterday (12 June), the EPA expressed its gratitude to “all those who, in one way or another, through their support, have made this happy event possible”. The grouping called on its supporters “to maintain the pressure, until all decisions to close places of worship in Bejaia and Tizi Ouzou are lifted”. In all, six churches and a day nursery had been closed since November. 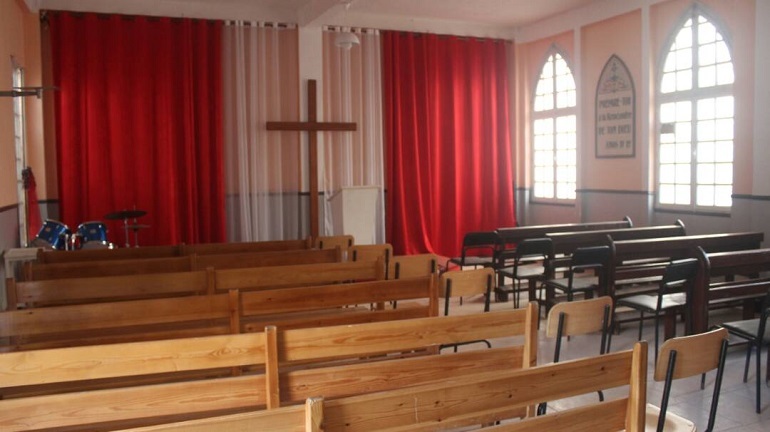 The most recent closures were on 26 May, when churches in Ait-Mellikeche (Bejaia province) and Maatkas (Tizi Ouzou province) were ordered to close. In March, the village church in Azaghar, near the town of Akbou (Bejaia province), was forced to stop all activities. A number of other churches have also received notifications to close down immediately. The three churches in Ait-Mellikeche, Maatkas and Azaghar are still closed. The government accused them of not complying with safety regulations and of operating without permission. But the EPA denied the accusations, stating that the government is simply implementing the 2006 law of regulating non-Muslim worship, which stipulates that permission must be obtained before using a building for non-Muslim worship, and that such worship can only be conducted in buildings which have been specifically designated for that purpose. But in practice, the authorities have failed to respond to almost all applications from churches for places of worship, including churches affiliated to the EPA, which was officially recognised by the government from 1974 until 2012, when new laws meant it had to re-register. Despite meeting all the legal requirements and applying for re-registration in 2013, the EPA is yet to receive an official government response, meaning, technically, it lacks official legal status. This article was updated on 20 June 2018 to reflect the reality that although all three churches were initially told they could reopen, one of them, in El Ayaida, remains closed.